Welcome to Mitzvah List, the World's Largest List of Mitzvah Dates. Check out our blog where you read about the hottest trends in planning a bar or bat mitzvah celebration. One of the most exciting and energetic parts of a Bar or Bat Mitzvah celebration is when the MC calls your child into the party room. All eyes are on your child as the music is pumping, the guests are standing and everyone is excited to get the party started. If you are looking for something unique to add even more excitement to your child’s grand entrance, adding an entrance video is the way to go. At Mitzvah List, we’ve heard of Entrance Videos, Mitzvah Skits, Montages and more, but we were confused about the differences. We asked Tony Gorkiewicz of TONE-e Films to tell us about entrance videos and how they enhance a party. TONE-e Films is way more than your typical bar or bat mitzvah videographer. Their creative team of professional film makers, TV producers, and post production editors have captured life events for more than 20 years! From entrance videos, montages, mitzvah videography, mitzvah skits, highlight films and more, TONE-e Films has the perfect package that will capture all of your heart-felt moments and be enjoyed by your friends and family for years to come. Tony told us that an entrance video is a short 1-2 minute video that is used to either introduce your child into their Bar or Bat Mitzvah party or as an introduction to a montage. Tony and his team schedule time with the Mitzvah Family to brainstorms ideas that highlight your child and their interests. Tony has created entrance videos with kids playing their favorite sports, with exciting voice overs, with a magician that makes the child magically appear, music videos, spoofs on a television show or even videos that make it look like the Mitzvah child is late to their own party. Entrance videos are different from Mitzvah skits, which will be the topic of our next article. 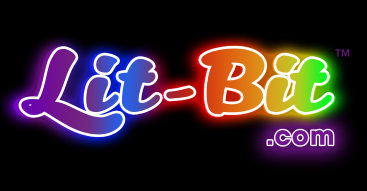 Lit-Bit‘s are sound activated, LED glowing, music “vibbing”, message flashing Wrist-Lits and Neck-Lits that kids and adults love! Not only does it carry the message of the celebration, but days after the last balloon has popped, the Lit-Bit will still glow with memories of an amazing party. Edgewood Country Club knows that your child’s Bar and Bat Mitzvah is a very special occasions and they are there to assist! They are known for our culinary excellence and talented catering team. Edgewood would love to host your child’s event and are happy to assist with menu selection, the candle lighting, montage, children’s activities and more! If you know of a fabulous vendor, let us know. We are always looking to feature new and exciting Mitzvah Vendors. We have expanded our vendor directory and now feature vendors in Michigan, South Florida, DC/Maryland/Virginia and Chicago.